information about the Stuck climb, and reveals that the Stuck triumph was an expedition marred by significant conflict. Without Karstens's wilderness skills and Alaska-honed tenacity, it is quite possible Hudson Stuck would never have climbed anywhere near the summit of McKinley. Yet the two men had a falling out shortly after the climb and never spoke again. In this book, Walker attempts to set the record straight about the historic first ascent itself, as well as other pioneer attempts by Frederick Cook and Judge Wickersham. Fans of Alaska literature, American history, and mountaineering lore will love this adventurous biography of the larger-than-life sourdough Karstens, in which Alaska, its wilderness, its iconic mountain, and its pioneer spirit looms large. Paper 6x9”, 300 pages, 60 black and white photographs, two maps, ISBN# 978-1-59485-729-4, published by Mountaineers Books. $19.95, plus 5.95 Priority mail. 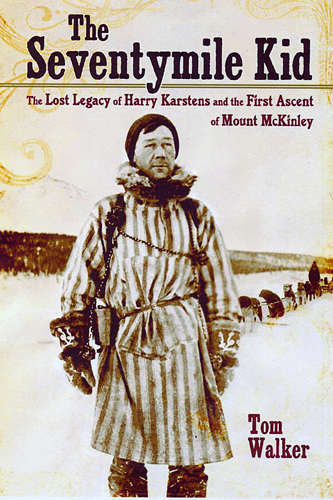 Harry Karstens, Denali Park's First Superintendent, climber and dog musher.